The measurement of multidimensional poverty has been advocated by most welfare scholars and is experiencing a growth in interest partly explained by controversial debates emerged across academics and practitioners. 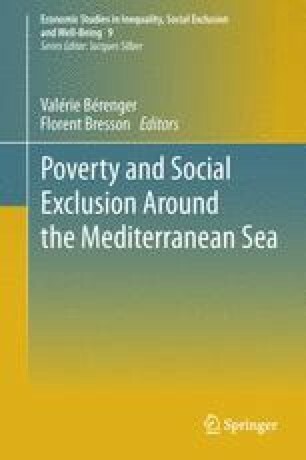 This chapter follows one of the least explored approaches—multiple correspondence analysis (MCA)—to assess multidimensional poverty in Morocco between 2001 and 2007. MCA provides two major advantages for the measurement of multidimensional poverty: it generates a matrix of “weights” based on the variance-covariance matrix of all welfare dimensions selected and provides a natural approach for constructing a composite welfare indicator that satisfies essential poverty orderings axioms. The application shows that poverty in Morocco has declined according to both monetary and multidimensional indicators and that these findings are robust to stochastic dominance tests. This chapter concludes that the sustained positive growth that Morocco experienced during the last decade has translated in improvements in living conditions well beyond monetary returns. The authors are grateful to Florent Bresson and Valérie Bérenger for very useful comments. Njong, A. M. & Dschang, P. N. (2008). Characterising weights in the measurement of multidimensional poverty: An application of data-driven approaches to Cameroonian data. OPHI Working Paper No. 21, wired at www.ophi.org.uk 1.